When my son was just weeks old, we started an infant massage class. He LOVED it. He’d lay on his back and just surrender—his chubby limbs falling limp to my gentle touch. Our instructor, amused by my son’s obvious pleasure, said, it looks like you’ve got yourself a little massage hog. She was right. Two years later, he still loves a little massage after his bath. A masshhhage peas, maman? Most people think of massage therapy as an extra, a superfluous thing one could do when one has extra time or money to burn. Actually, it’s much more than relaxing me-time. A massage is quite seriously good for your health. Studies continue to prove the physical and emotional benefits of even a single massage therapy session. It not only helps to keep your muscles flexible, but also prevents the build up of knots and tensions in neck and back, and helps keep toxins at bay. Many of us are dealing with some kind of postural stress that often manifests in the shoulders and neck. I recently had major neck and shoulder pain—most likely due to time sitting incorrectly at my desk and picking up my growing toddler several times throughout the day. The pain was so bad that I had a terrible time sleeping. I finally made an appointment to see a massage therapist. Ahhh, why did I wait so long??? My session was 60 minutes of sheer bliss. I felt so relaxed that I fell asleep on the massage table! Those of you who work at a desk, beware. More advanced forms of postural stress are often caused by prolonged periods of sitting. Fortunately, massage can counteract the imbalance caused from sitting and can help with a variety of other issues like neck and back problems; migraines; stress and tension; keeping joints and muscles flexible; boosting the immune system; and more. I wish I could get a massage every week, or every two weeks, or even once a month, but that’s not always feasible for me. What I realize now though, is that I should try to make it more of a priority to schedule an appointment, just as I do with things like regular dental appointments. The fact is, we all need a massage every once in a while and the older you get, the more you need one. What do you think of massage therapy? When was the last time you had a massage? 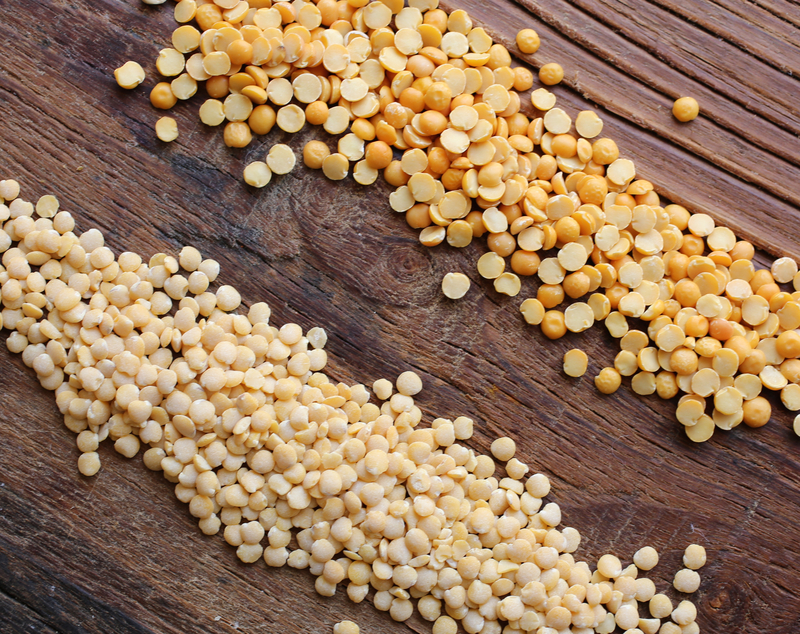 I usually cook and eat lentils—in any form or variety—about three times a week. Seriously, I’m not kidding. This soup may look like something (Coconut Red Lentil and Red Kuri Squash Soup) you’ve seen here before, but it’s different and absolutely one of my favorites!! 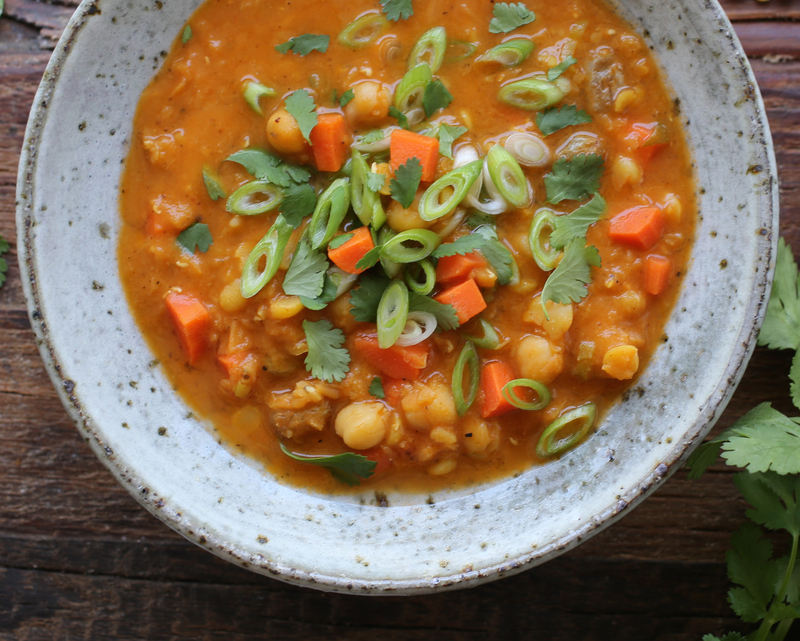 Golden in color, this warming, curry-spiced coconut broth is thickened with red or golden (photographed here) lentils, yellow split peas, and garbanzo beans, this soup is full of fabulous flavor and texture. We never tire of it. As red lentils are easier to find, use them and the soup will still turn golden in color when cooked. Serve with bread or ladle on top of farro, brown rice or other grain of choice. If you like, top with avocado. Rinse lentils and split peas until the water is no longer murky. Discard the murky water. Place rinsed lentils and peas in a large soup pot, cover with about 8 cups of water, and bring to a boil. Reduce heat to a simmer and add carrots and ¼ of the ginger. Cover and simmer for about 30 minutes, or until the lentils have broken down and split peas have softened. In the meantime, in a small dry skillet or saucepan over low heat, toast the curry powder until it is quite fragrant. Be careful though, you don’t want to burn the curry powder, just toast it. Set aside. Place the coconut oil in a another pan over medium heat, add half of the green onions, garlic, the remaining ginger, and raisins. Sauté for two minutes stirring constantly, then add the tomato paste and sauté for another minute or two more. Add the toasted curry powder to the tomato paste mixture, mix well, and then add this to the simmering soup along with the cooked garbanzo beans, coconut milk and salt. Simmer, uncovered, for 20 minutes or so. The texture thickens the longer it is simmered. Feel free to adjust the consistency by adding more water, if you prefer. Je t’en prie Patricia! J’espère que tu aimeras la soupe autant que moi!!!! Gros bisous! Thank you Sonal. This is really one of my favorites! Merci Darya. Turmeric! I’ve been wanting to do a post on it. Such wonderful health benefits! Thank you! So glad you liked it!!! Thank you for your kind words Cristina!! I love making soups, especially at this time of the year! 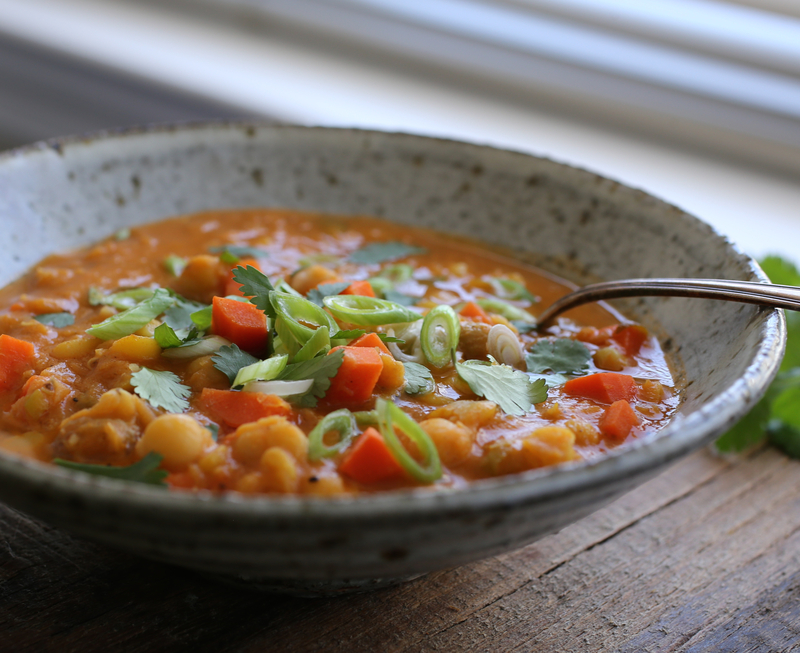 What a comforting and hearty lentil soup. I must make this recipe! Thank you Thalia! I hope you make this soup and love it as much as I do! It’s really one of my favorites! Thank you Nomzi! Glad you like it! Made this delicious soup tonight! We all loooved it, toddler included. I simmered it until thicker consistency and served it with steamed rice and broccoli. Thx! So glad you all liked this soup!!! I like it thick too and great idea to serve it with broccoli! Thanks for trying it and giving your feedback!